Entrepreneurship is often considered only in the context of new venture creation, small business issues, and the profiles and personalities of individual entrepreneurs. The emphasis in Creating and Re-Creating Corporate Entrepreneurial Culture is very much on the 'corporate', it focuses on the creation and maintenance of an entrepreneurial management culture that accelerates growth and enhances effectiveness and competitiveness in large organizations. 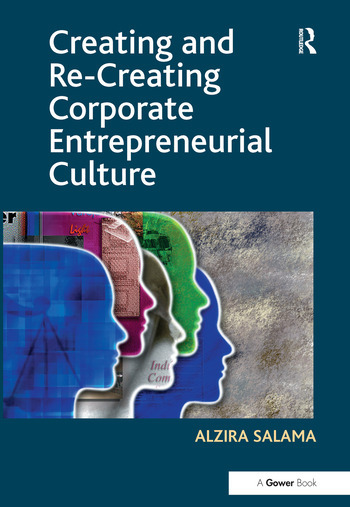 Alzira Salama explains what constitutes entrepreneurial behaviour, how it is facilitated by organizational culture and why entrepreneurial corporate culture is fundamental to business success. She takes you through ways of identifying prevailing cultures and explains how cultures are reinforced or changed. Drawing on exemplary case studies from around the world, she tells the stories both of successful and unsuccessful interventions made in response to the need to move on from bureaucratic or authoritarian cultures. These include specific instances where the context has been privatization, merger and acquisition, transition in the wider economy, or a combination of any of these circumstances. This enlightening book will help managers and consultants, business educators, higher level students and those on executive programmes to understand the nature of an organization's culture, why it is as it is, whether it needs to change, and how it might be changed. Alzira Salama offers real world examples of how to create or re-create an entrepreneurial culture together with tools that will enable corporations to achieve it. Dr Alzira Salama is a management consultant and a senior lecturer at the London campus of the European School of Economics (ESE), where she was Academic Director for four years. She has a PhD in Organizational Behaviour from Lancaster University. Before embarking on academic life Alzira Salama worked for ten years as Management Development Manager for Verolme do Brazil, a large Dutch shipyard, and as an Executive Education specialist at Xerox Corporation. This experience has been fundamental for her understanding of human behaviour issues at the work place. Alzira Salama lectured at Cranfield School of Management. She was a visiting researcher and lecturer at the European Business School (EBS), London and at the London School of Economics (LSE). She has been involved in action research projects, delivered many conference papers and is widely published, winning awards in the process. Her earlier book is entitled Privatization: Implications for Corporate Culture Change.